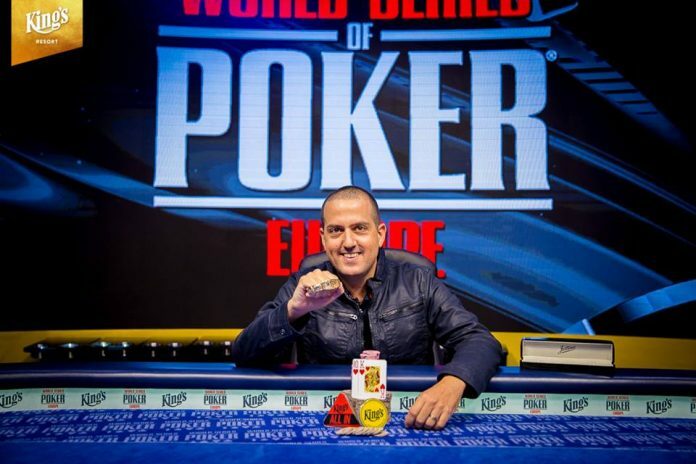 Tamir Segal beat out almost 3,000 players to win his first career WSOP bracelet (WSOP photo). The first event on the World Series of Poker Europe schedule featured eight starting flights and 2,992 players. When it was all over, Israel’s Tamir Segal stood tall to claim not only his first career WSOP cash but a brand new bracelet to go with it. Segal went to work right away at the final table. Björn Bouwmans raised to 1,200,000 from the cutoff seat with before Segal shoved all in from the button with . Bouwmans called off the rest of his stack and found a safe flop. The turn was the though and Bouwmans was eliminated after the river failed to save him. Just about a half hour later, another all-in preflop battle resulted in another elimination. Wojciech Wybreski raised to 1,250,000 from early position with and Krasimir Yankov called all in with . The board ran out to give Wyrebski top pair and bust Yankov in eighth. Flavio Decataldo raised to 2,250,000 with from early position and Segal defended his small blind with . The flop changed nothing and after Segal checked, Decataldo moved all in for 8,850,000 and Segal called instantly. The turn was the and the river was the to eliminate Decataldo and give Segal over half of the chips in play with six players remaining. Segal put those chips to work almost immediately, resulting in yet another elimination. Segal raised to 1,200,00 from under the gun with and Francesco Delfoco called all in with . The flop all but eliminated Delfoco. The turn left him with just four outs and the river was not one of them. The next player eliminated was not a victim of Segal’s. From the button, Hannes Neurauter moved all in for 2,300,000, Segal called from the small blind and Aksel Ayguen called from the big blind. Segal then checked the flop before Ayguen moved all in. Segal folded and Ayguen tabled while Nearauter showed . The turn provided extra out for Nearauter, but he failed to connect on his flush draw as the turn hit the river. Ayguen kept the pressure on and found another victim. Ayguen raised to 1,300,000 from the under-the-gun position with and Dariusz Glinski, down to less than five big blinds, called all in from the button with . The flop left Glinski with little hope. The turn gave Glinski chop outs, but the river sealed his fate and eliminated him in fourth. Despite eliminating Nearauter and Glinski, Ayguen’s run ended in third place. After he moved all in from the button for 6,850,000 with only to have Segal call from the big blind with . The flop kept Ayguen in control but the turn and runout gave Segal Broadway to eliminate Ayguen and send the tournament to heads-up play. Starting heads-up play with 80% of the chips in play, Segal needed just 18 minutes to eliminate Wyrebski to pick up his first WSOP bracelet. On the final hand, Wyrebski raised to 3,000,000 with and Segal moved all in over the top with . Wyrebski called instantly and then could only watch in horror on the to give Segal the final pot.